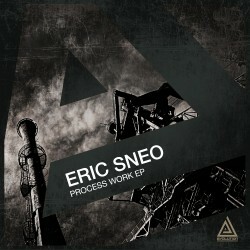 German Techno producer Eric Sneo has been in the scene for over 10 years now. From his humble beginnings as resident Dj in one of Germany’s most famous Techno clubs, to his countless releases and collaborations on multiple labels including his own, the young artist has made a name for himself internationally. He’s been known for his live sets that blend electronic Techno and house music with live acoustic and electric instrumentation. Its not often you see an Electronic music producer playing didgeridoo during one of their sets. Sneo dropped another EP this time on Evolution. Any returning fans of the artist’s well-blended Techno will not be disappointed. Both tracks on Process Work feature brilliantly textured atmospheric sound design and bass that packs a heartfelt punch. The highlight for me is the title track. It breaks as hauntingly designed synths play incredibly powerful melodies before bringing the kick back in. It’s the sort of track you rewind about 5 times just to make sure what you heard was real.